The U.S. maritime world is rapidly changing direction as security becomes an ever larger and more important issue to the federal government. We have seen the Department of Homeland Security created, the Maritime Transportation Security Act of 2002 become law, and the International Maritime Organization (IMO) establish new standards. The new international requirements will go into effect in July 2004, and will apply to US vessels in international trade, foreign vessels that call on US ports and US facilities that engage in international trade. In many respects they mirror MSTA '02. The USCG has made it very clear that these international security requirements will be applied to domestic trade vessels that meet the criteria and to domestic trade facilities that are at risk of being involved in a transportation security incident. This includes all facilities that handle oil and regulated chemicals, and may include other bulk cargoes that are classed by the government as being hazardous materials. 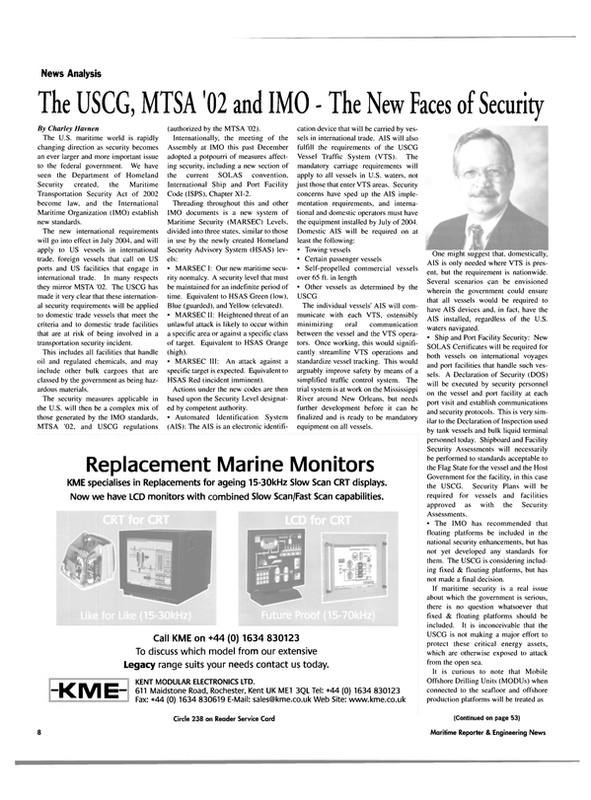 The security measures applicable in the U.S. will then be a complex mix of those generated by the IMO standards, MTSA '02, and USCG regulations -KME- (authorized by the MTSA '02). Internationally, the meeting of the Assembly at IMO this past December adopted a potpourri of measures affecting security, including a new section of the current SOLAS convention. International Ship and Port Facility Code (ISPS), Chapter XI-2. Threading throughout this and other IMO documents is a new system of Maritime Security (MARSEC) Levels, divided into three states, similar to those in use by the newly created Homeland Security Advisory System (HSAS) levels: • MARSEC I: Our new maritime security normalcy. A security level that must be maintained for an indefinite period of time. Equivalent to HSAS Green (low). Blue (guarded), and Yellow (elevated). • MARSEC II: Heightened threat of an unlawful attack is likely to occur within a specific area or against a specific class of target. Equivalent to HSAS Orange (high). • MARSEC III: An attack against a specific target is expected. Equivalent to HSAS Red (incident imminent). Actions under the new codes are then based upon the Security Level designated by competent authority. • Automated Identification System (AIS): The AIS is an electronic identification device that will be carried by vessels in international trade. AIS will also fulfill the requirements of the USCG Vessel Traffic System (VTS). The mandatory carriage requirements will apply to all vessels in U.S. waters, not just those that enter VTS areas. Security concerns have sped up the AIS implementation requirements, and international and domestic operators must have the equipment installed by July of 2004. Domestic AIS will be required on at least the following: • Towing vessels • Certain passenger vessels • Self-propelled commercial vessels over 65 ft. in length • Other vessels as determined by the USCG The individual vessels' AIS will communicate with each VTS, ostensibly minimizing oral communication between the vessel and the VTS operators. Once working, this would significantly streamline VTS operations and standardize vessel tracking. This would arguably improve safety by means of a simplified traffic control system. The trial system is at work on the Mississippi River around New Orleans, but needs further development before it can be finalized and is ready to be mandatory equipment on all vessels. One might suggest that, domestically, AIS is only needed where VTS is present, but the requirement is nationwide. Several scenarios can be envisioned wherein the government could ensure that all vessels would be required to have AIS devices and, in fact, have the AIS installed, regardless of the U.S.
• Ship and Port Facility Security: New SOLAS Certificates will be required for both vessels on international voyages and port facilities that handle such vessels. A Declaration of Security (DOS) will be executed by security personnel on the vessel and port facility at each port visit and establish communications and security protocols. This is very similar to the Declaration of Inspection used by tank vessels and bulk liquid terminal personnel today. Shipboard and Facility Security Assessments will necessarily be performed to standards acceptable to the Flag State for the vessel and the Host Government for the facility, in this case the USCG. Security Plans will be required for vessels and facilities approved as with the Security Assessments. • The IMO has recommended that floating platforms be included in the national security enhancements, but has not yet developed any standards for them. The USCG is considering including fixed & floating platforms, but has not made a final decision. If maritime security is a real issue about which the government is serious, there is no question whatsoever that fixed & floating platforms should be included. It is inconceivable that the USCG is not making a major effort to protect these critical energy assets, which are otherwise exposed to attack from the open sea. It is curious to note that Mobile Offshore Drilling Units (MODUs) when connected to the seafloor and offshore production platforms will be treated as port facilities for the first time. Historically, they have been treated by the international community as vessels. The USCG's treatment of them is quite ambiguous. Sometimes they treat these oil patch units as vessels, sometimes as facilities. • Vulnerability Assessments and Security Plans: The new amendments require port facilities and ships to perform vulnerability analyses and develop security plans. This is extremely farreaching, and would impose international standards on facilities throughout the US (including all inland port facilities along USCG-superintended waterways), as well as each and every vessel and port. This will require the expenditure of a lot of financial resources. • Container Security: All major container facilities worldwide will be linked and utilize a risk based container monitoring system currently in use by the U.S. Customs Service. The elements of this system include: • Establishing security criteria to identify high-risk containers • Use technology to pre-screen highrisk containers before arrival at U.S.
ports • Develop and utilize smart and secure containers. This all sounds great - but how will it work? How much can we depend on foreign interests? Will this require stationing U.S. Customs Inspectors overseas? • Seafarer Identification: Positive and verifiable identification for all seafarers. Positive meaning that the document holder is the person to whom the document was issued, and verifiable meaning the validation of the authenticity of the document by an acceptable source. The identification will contain: a digital photo, holder's signature, issuing authority, proof of nationality, positive identification of mariner's qualification, permission to enter other countries, and biometric template (digital fingerprint). It seems probable that this will become deeply embroiled in international politics and will not be completed for many years. • Means of Ship alerting: An alarm will be installed on each vessel similar to the EPIRB that will transmit via satellite communications if the vessel is a victim of piracy/armed attack. This will utilize existing technology where possible and add equipment where necessary. The Coast Guard published a Notice in the Federal Register on December 30, 2002 discussing public meetings held around the country, starting at the end of January, concerning security. The Notice asks for input on 40 specific questions concerning possible directions for the national maritime security efforts to take. Reviewing the Federal Register leads one to conclude unquestionably that our maritime world is going to go through a fairly dramatic change in the coming months and years. The US has been an extremely successful open society, with only limited restrictions placed upon individual freedoms. The threat of terrorism, coupled with the confrontations with Iraq. Iran, and North Korea, is changing this openness. The last set of national changes in maritime direction were the result of the catastrophic grounding of the Exxon Valdez in the spring of 1989, which led to the passage of the Oil Pollution Act of 1990 (OPA '90). At that time, the USCG implemented many of the important, initial requirements of OPA '90 via Navigation and Vessel Inspection Circulars (NVICs), and the regulations came later. Time was pushing action. Reaction from the IMO came much later. This time, the governmental shift in direction toward national security is happening differently. For virtually the all of calendar 2002, Congress was at a standstill, with no maritime security legislation of any consequence being passed. All the while, the USCG was working with the IMO to develop international standards. This was time well spent, as the Coast Guard was spearheading efforts to develop (at an expedited pace) international security measures through IMO, rather than go first through Congress, and then through IMO. In the past, many knowledgeable in the workings of government had accused the USCG of engineering requirements through the IMO that the maritime public would find onerous, and which Congress would not pass on their own (before it even reaches the President to be signed into law). There is no question that the USCG prodded, coaxed, and cajoled IMO into action with regard to the current security issues as was done with OPA '90. It is not clear if the USCG's actions will create any economic impact on competition, or if it will simply be something that all in the trade will adjust to and go about its business. One might well question the ability of small operators, both of vessels and facilities, to make the shift to these enhanced security requirements without suffering severe economic consequences. There is also an acute subjective element in the domestic application that would appear to allow different (or even the same) USCG Captains of the Port to enforce different standards at the same type of facility in different locations. Application of this type of variable judgmental standard has not been the Coast Guard's forte in the past, and could lead to serious problems. The USCG has led off recent security initiatives with the use of voluntary or recommended standards published as NVICs. The enabling statute, the Marine Transportation Security Act of 2002 (MTSA '02) waives the Administrative Procedures Act, which controls the regulatory promulgation process. We will see regulations concerning security plans by Q2 2003. It is also possible that the USCG will fall back on the use of mandatory NVICs if the regulatory process stalls. All of these issues passed the IMO General Session, and will be requirements for international trade by July 2004. The biggest concern of all this is the overall effect of all of these security measures on commerce. How many vessel operators and facility operators will simply disappear because their physical plant cannot conform to the new standards or because they cannot afford to absorb the cost of the new security measures? How will they be applied fairly on a nationwide basis without economic harm to some and advantage to others? Uneven application of the standards seems to be encouraged for good and just reasons. With the FOIA disappearing for Security Sensitive Information (SSI), how will anyone ever find out if the economic advantage is granted to an operator, or denied another? Will all of these measures directly eliminate the potential for maritime sabotage without dramatic impact upon our maritime infrastructure? Tough question - potentially scary answer. Charley Havnen is a Commander USCG Ret. His organization can help you with your vessel construction project, regulatory problems, vessel manning issues, procedure manuals, accident analysis or serve as an expert witness. His organization can do what you can't or don't want to do, and are online at www.havnengroup. com. He can also be reached by contacting the Havnen Group in New Orleans: (800) 493-3883 or (504) 394- 8933, fax: (504) 394-8869.